Although the dance of death in various art forms is a widely used concept, it seems very difficult to find its origin. With a real 'dance' it has often little to do. Everyone gives its own interpretation at the concept. Just about everything in which dance and death are related to each other can be called a dance of death. As a dance form, according to some sources, it was in a pretty dark past customary for the mourners at a funeral in the cemetery (and on the graves) to dance until they felled into ecstasy, and they came to rest in the church. Later this would be forbidden by the church. Usually death dance is used as a metaphor, and not as a dance. Often about the dance of death is referred to the plague, the Black Death. Which reached its peak between 1348 and 1351 in Europe and took at least one third of lives of the population. With low life expectancy, many wars and famine, death was daily present and life very relative. For one a liberation, for the other a punishment. The plague, for some, a punishment from God, led to extremes and misdeeds, flights, refusing the sick, to pray, processions or a dissolute life. In the visual arts, death is represented by a skeleton, sometimes with tombe or scythe. The message a depicted dance of death had to bring was that Death would take everyone, regardless of rank or wealth, sooner or later. Every day can be your last, so be prepared (and live godly). A procession of skeletons or decomposing bodies sometimes dances led by the Grim Reaper. A "comic book" in which Death invites everyone. 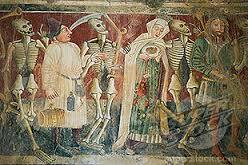 According to Hoek is a fresco on the wall of the church (1410) of La Chaise - Dieu, the oldest surviving dance of death. An early and well-known depiction of the dance of death is that of the Cimetière des Innocents in Paris, which was created in 1425, but was later demolished. Also a 15th century fresco in the Peter Chapel in Macra Valle Maira at Saluzzo in northwestern Italy is one of the very earliest dances of death.